Divide chicken pieces and marinade between 2 sealable plastic bags. Seal bags, pressing out excess air, then turn bags over several times to distribute marinade. 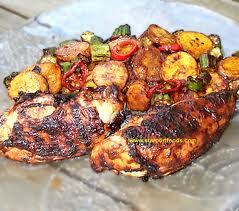 Put bags of chicken in a shallow pan and marinate, chilled, turning once or twice, for 24 hours. Remove from marinade wipe marinade from skin side only. When charcoal turns grayish white and you can hold your hand 5 inches above rack for 3 to 4 seconds, sear chicken skin side down in batches on lightly oiled rack over coals until well browned on all sides, about 5 minutes per batch. watch carefully do not let your chicken burn. Move chicken as seared to side of grill with no coals underneath, then cook, covered with lid, until cooked through, 25 to 30 minutes more. Serve chicken with your favorite salsa.